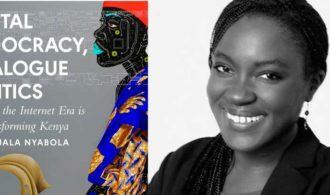 Nanjala Nyabola’s new book of essays called Digital Democracy, Analogue Politics: How the Internet Era is Transforming Kenya (African Arguments) is now available on Amazon. Nanjala Nyabola is a Kenyan commentator giving opinions with a focus on politics, war, social justice, books, and feminism. She contributes opinions to a variety of media outlets including the BBC, Al Jazeera, Okay Africa, The New African, The Guardian (UK), Foreign Policy, and a raft of many others. Nyabola has contributed to two publications in the recent past including Africa’s Media Image in the 21st Century: From the “Heart of Darkness” to “Africa Rising” (Communication and Society) edited by Mel Bunks, Suzanne Franks, and Chris Patterson. Her other contribution is to African Women Under Fire: Literary Discourses in War and Conflict which was edited by Pauline Ada Uwakweh. You can get your own copy of this book here. You can also follow her exploits on her Twitter.